I ripped out the Royal Burgundy bush bean plants this evening. They were not good enough to motivate me to harvest. What was the problem with these beautiful beans? Flavor and texture: Raw these beans are inedible, kind of like chewing on cardboard. I timed the cooking – Royal Burgundy required 7-8 minutes of boiling or braising to be tender enough to eat. Their flavor is mediocre – the mild bean flavor is almost undetectable, raw or cooked. The beans loose their burgundy color during cooking, but they are not tender until 5 minutes after they turn green. Pollination: The plants have been loaded with flowers for the last three weeks. Unfortunately the number of beans is smaller than the quantity of flowers would predict. I suspect a lot of flowers have simply dropped off, unpollinated. I’ve harvested a lot of beans that are only 2″ long, with only one seed: a sign of poor pollination. Perhaps this is a blessing in disguise considering the flavor. Royal Burgundy beans ready for harvest. Growth habits: the plants are lanky and floppy. 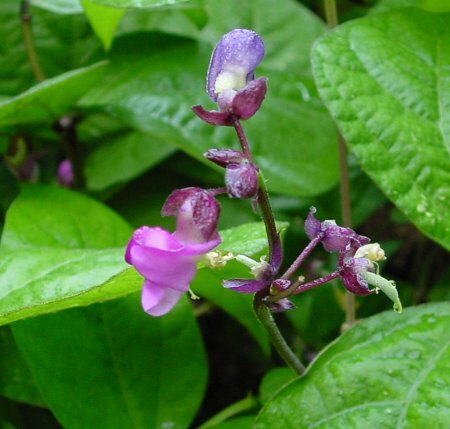 They run about 2′ tall, but they are true bush plants, not half-runners and they will not climb. The plants also seem very brittle; it’s easy to break off leaves while searching for beans. With their floppy habits, I found them difficult to pick. Anything good about Royal Burgundy? The beans do not need stringing, even when mature. 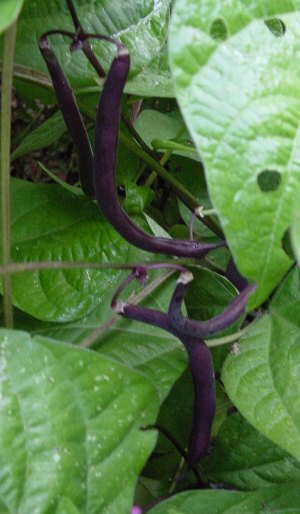 The plants are a beautiful dark green with burgundy stems and beans. You may think I’m too critical. I judge beans by how they compare to my Rattlesnake pole beans. Rattlesnake is tender and flavor-full fresh from the garden. I frequently eat the baby beans raw, one second after harvest. 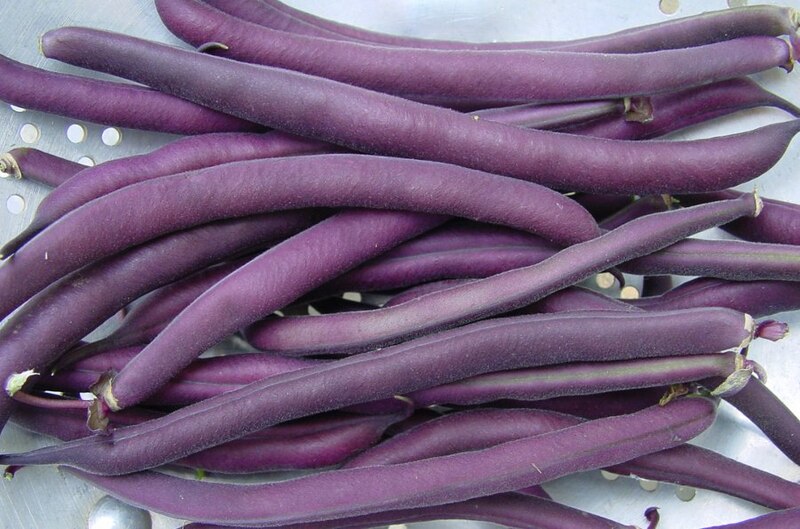 Cooking Rattlesnake beans takes only 2-3 minutes; they are done as soon as their purple makings disappear. 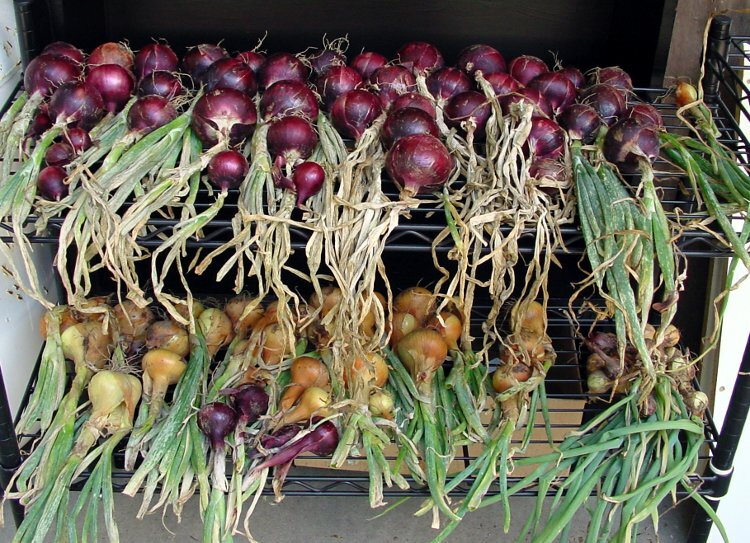 Drying onions: top Cabernet, grown from seed, bottom, grown from sets. This week I’ve been harvesting potatoes and onions for storage. The potato bed is mostly empty; I’ll plant snap peas there today. The onions are drying in a protected area on the deck. My rack is full, but there are still lots more onions to harvest. Look carefully at the picture, bottom shelf. The big onions on the left were grown in full sun at my community garden plot, the tiny ones on the right were grown in the shadiest part of my home garden. Sunlight makes a difference. The weather has been rainy all week, roughly 3″. A brief, intense thunderstorm Thursday 7PM knocked out power for 20 hours. From the house, we watched the power lines arc and spark for a full minute before the transformer popped and the fireworks ended. Beans: 1 # Royal Burgundy; plus the first Rattlesnake pole beans of the season. Several were eaten in the garden. 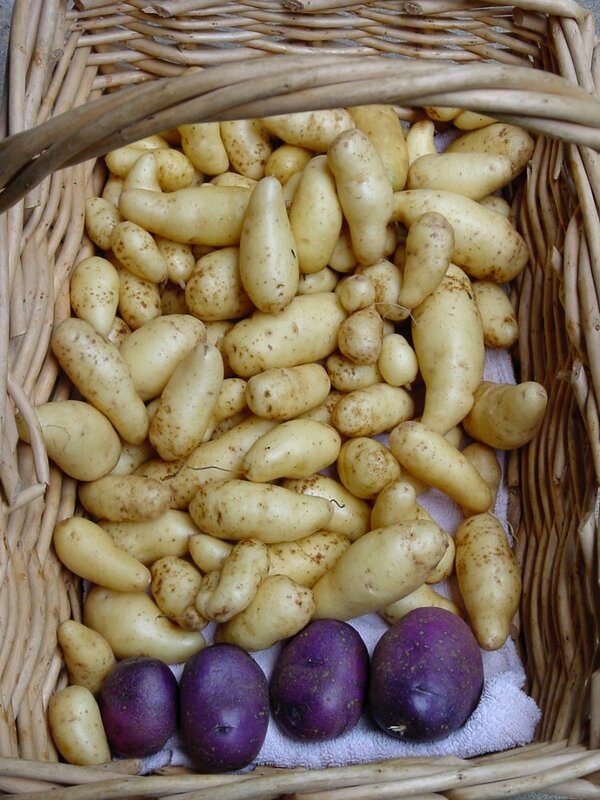 4 pounds Fingerling potatoes & 6.5 ounces Adirondack Blue. Cucumber: .8# Sweet Success. My first cuke of the year – planted late (6/5) so first harvest is late. Lots more coming. Potatoes: 20.4 pounds of several varieties. When the harvest is complete I’ll write a post comparing varieties. Tomatoes: 7.8# Sungold from the 3 plants in my sunny community garden plot, .45# Sungold from the 4 plants in the shade at home. I oven-roasted 3# then froze for winter eating.